The Samsung Galaxy S4 Active has made another appearance online, this time in a benchmark result which claims to reveal a new processor and slightly altered named. According to details which have appeared on GFXBench the rugged handset in question could well be known as the Samsung Galaxy S4 J Active, although that seems like more of a development moniker than something the Korean firm would actually market. In terms of specs the benchmark result apparently reveals a couple of details including a 1.9GHz Snapdragon S4 Plus quad-core processor - which is different to the Snapdragon 600 clocked at the same speed in the Galaxy S4. The water- and dust-proof handset will also come running Android 4.2.2 Jelly Bean, with model SGH-I537 said to be destined for the US, while GT-I9295 will pop up in Europe. You can still expect to see a full HD display on the S4 J Active, although we wouldn't be surprised to see a thicker slab of glass laid over the top to provide extra protection. 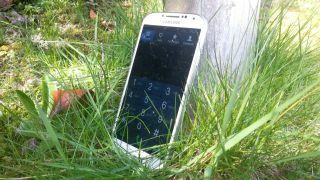 There's no further word on when the Galaxy S4 Active may make an appearance, but earlier reports seem to point towards a June or July release, so watch this space.